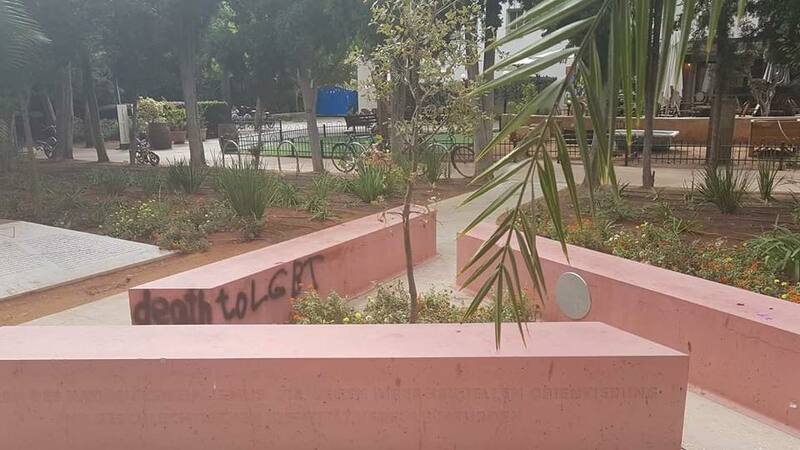 The words “Death to LGBT” were found scrawled on a monument in Tel Aviv that commemorates members of the community who were persecuted by the Nazi regime for their sexual orientation and gender identity. Passersby discovered the graffiti on Thursday, October 25, 2018, at the monument in Meir Park where the LGBTQ community center is located. The vandalism co-coincidentally occurred on the eve of A Wider Bridge’s Fall 2018 LGBTQ Leadership Mission to Israel. On his personal Facebook page, AWB’s Executive Director Tyler Gregory put out a call to action urging leaders to stop inciting violence. Tel Aviv Mayor Ron Huldai condemned the vandalism and immediately ordered the graffiti removed. “We will continue to act and to protect members of the community as we have done so far,” he said. A day after the graffiti was removed, A Wider Bridge’s Mission to Israel visited the monument as part of their trip to meet with LGBTQ community leaders in Tel Aviv. Mayoral candidate Asaf Zamir wrote on Twitter that he was shocked by the crime and expressed hope that the police would find the perpetrators and bring them to justice. “I have no words to describe the feeling of aversion to anyone who thinks that he can threaten the members of the proud [LGBTQ] community. I will continue to support community members and to work actively for their freedom and rights,” he added. The third candidate on his Rov Ha’ir list is LGBTQ community leader Chen Arieli.